Part 3 of our ten-part series on proposed improvements to TriMet's concept map sends us into the Southwest suburbs of Portland. Tigard is a city that has a fair amount of transit service. However, it is still lacking in two major areas: (1) lack of service to large sections of the population, and (2) paths of transit and paths of actual people-traffic not going the same directions. 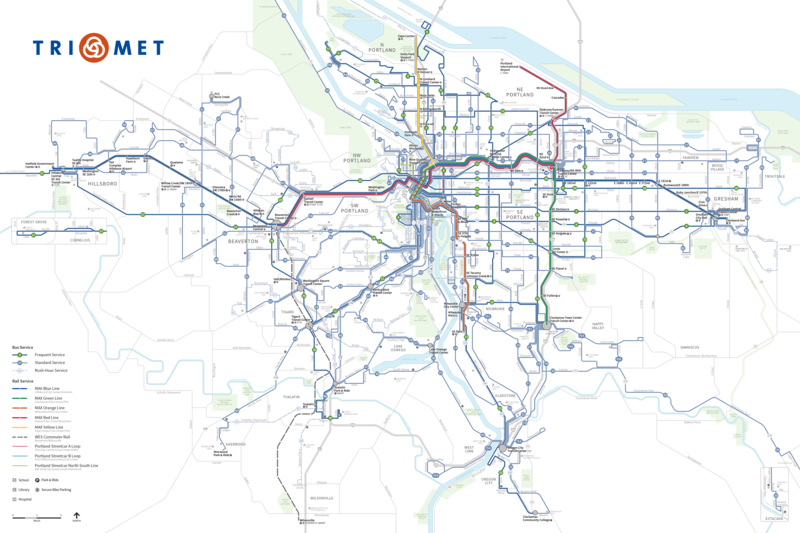 TriMet has proposed new routings and connections in the area; I further these ideas and offer new suggestions on equitable and logical ways to make the system work better. This June, TriMet will begin service on Line 97-Tualatin/Sherwood, the first completely new-service line in the city in years. This is quite significant, since (according to TriMet) there has never been a bus line connecting Tualatin and Sherwood. It will start as a rush hour-only bus line and will eventually be expanded to full service, possibly even running up SW 72nd Ave to the Tigard Park & Ride. Now that this major gap is being filled, we can start to dream about other changes. Line 12-Barbur used to run from Portland all the way to Sherwood via Tigard TC and King City. During the recession, they split the line at Tigard, making Line 94 serve Pacific Hwy between Tigard and Sherwood and letting Line 12 continue to Portland and Parkrose TC (where it connected to Line 21, another lob-off line). Needless to say, TriMet hastily designed these changes without really keeping the riders in mind, and has spent the last few years fixing what they messed up. Now, two lines run between Tigard and Sherwood: Lines 93 and 94. 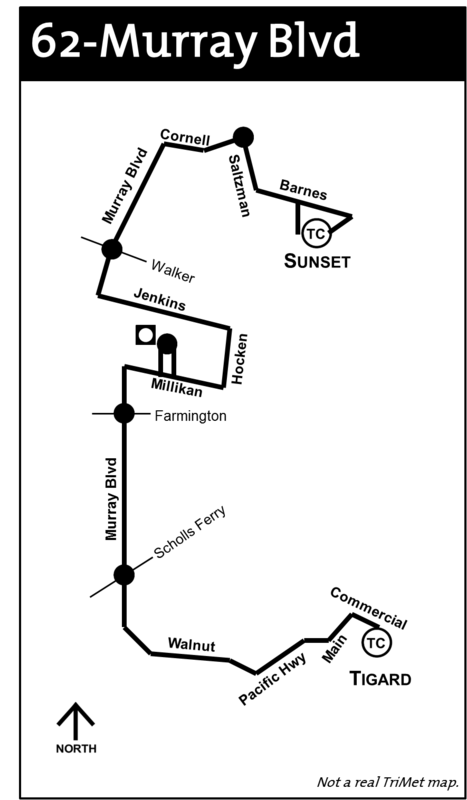 Line 93 runs between the actual transit center and Old Town Sherwood all week long; Line 94 runs between Downtown Portland and Old Town Sherwood via Barbur, Main St and Pacific Hwy. It stops at Main & Commercial, one block from the transit center, and runs weekdays only. Quite an improvement from the initial changes, but still a far cry from the optimal design. The 45 drops in from Washington Square to serve 121st and Walnut before reaching Tigard TC. Also, Line 64 runs express to Tigard from Marquam Hill, stopping only at Tigard P&R and Tigard TC. Tualatin gets the 96 from Portland which runs decent peak hour service and a few quasi-midday trips; also the rush-hour 38 comes in to Tualatin from Portland via Kruse Way and 72nd. Lines 36 and 37 bridge the gap between Lake Oswego and Tualatin, with the 36 serving South Shore Blvd and Rivergrove (and Portland during rush hour), and the 37 providing absolutely terrible service on Country Club and Boones Ferry. To sum it up, there is somewhat decent direction to cover the usual commuter trips to and from Portland. But if anyone would want to actually travel within the Southwest suburbs, quite frankly, you are out of luck. Notice how I put the 93 in scare quotes? That's because I believe that the 93 and 94 should be one route. I think that all trips should serve Tigard TC, and every other trip would run express to downtown. Wouldn't this make so much more sense? Now, TriMet wants to avoid sending all the 94 buses during rush hour through the Tigard TC. And I say you don't need to. There is a perfectly good sidewalk on the other side of the abnormally wide Commercial Street that could be used as a 94 bus stop. Buses to Sherwood could turn left from Main onto Scoffins, right Ash, right Commercial through the stop across the street from the main bus bays, and left Main. Buses to Tigard would do the exact same thing, just starting from Main and turning right onto Scoffins (all buses would run clockwise). The only sticky situation here is that the turn from Main onto Scoffins is a bit tight for a 40-foot bus. However, a little planning and cooperation with the City of Tigard and you could create an easy turn that would help all the buses flow smoothly through Old Town Tigard while allowing riders to make all their transfers easily and efficiently. Fooled ya! TriMet wants to take the 45 bus from Portland to Beaverton TC via Garden Home, 92nd, Scholls Ferry, Denny, and Hall. So this line would no longer go anywhere near Tigard. Obviously, some line(s) should make up this gap in service! and Walnut St now make a thoroughfare from Cedar Mill to Tigard, and the 62 should be changed to reflect this. 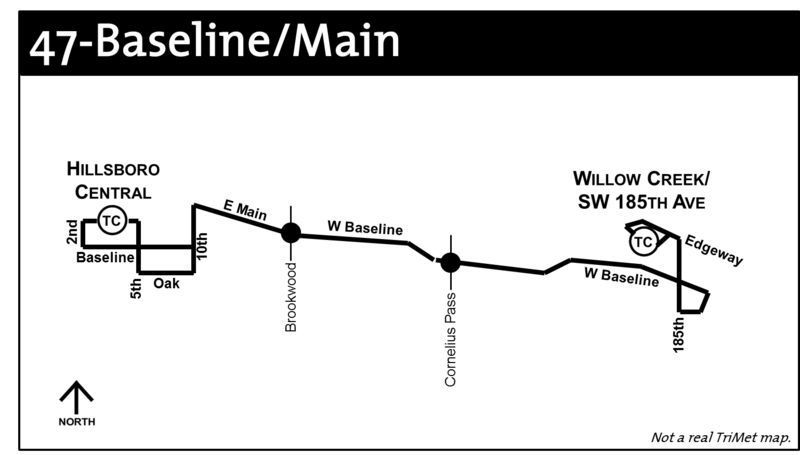 It would run straight from Cornell Rd all the way to Pacific Hwy, only detouring to serve the Millikan Way MAX station. This would take the service from the 45 on Walnut between Tiedeman/Fonner and Hwy 99W, and will add service between Scholls Ferry and Tiedeman. TriMet has a plan to keep the 62 going to Washington Square alongside the 56 on Scholls Ferry, while bringing the 37 (I know, random, right?) over to serve Walnut to Progress Ridge. I think this is inconsistent with current road design logic. It is rooted in the dependency of people going from Murray directly to Scholls Ferry, which has always been nice but doesn't give flexibility to change for the better. In a later post, I will explain how I have designed the transfer between the 56 and 62 to make it easier on people who use this path. But the 62 needs to go down Walnut, plain and simple. This is what we call "progress." TriMet has been planning for years to make Line 76 a Frequent Service line, and it needs it. Service on these two lines between Beaverton and Tigard is already at 15-17 minutes during the day all week, but it's the other times that are hit and (usually) miss, besides the lack of service to Tualatin. By turning the 76 to Frequent Service, it gives flexibility of moving the 78 so that it is not providing redundant service and can serve new roads. TriMet has proposed to take the 78 out of Tigard TC onto Hall Blvd northbound and have it serve Hall all the way to Washington Square, then have it turn up Scholls Ferry to Allen and jump over to Lombard, taking that road along with the 88 to Beaverton TC. I like this idea, as Allen has little service to speak of east of Lombard. This will also better serve the north Tigard communities and Metzger. If the 97 replaces the 38 service, then where will the 38 go? TriMet wants to take the 38 straight down Boones Ferry past Mountain Park, with the Line 44 extension serving that area. The 38 would travel down Kruse Way like it does now, then turn on Bangy Rd to Bonita, eventually ending up at Tigard TC. TriMet proposes that it take Hall to McDonald, then cut over to Pacific Hwy, but I think it makes more sense for the Gaarde bus to cover both sides of Pacific Hwy. So I take the 38 straight up Hall into Tigard TC. This route optimization would allow for full weekday service on the 38, as well as putting full week service on 72nd someday via Line 97. TriMet wants to make another long north/south connector route out of Line 67. It would run down 158th to Merlo and continue to 170th, where it would run as far as Bany/Hart, following Line 88 to 155th. (Line 88 would be re-routed to Davis St instead of Hart Rd.) Line 67 would take 155th to Beard/Brockman and then follow the 92 route to 125th. At Scholls Ferry it would jump over to 121st and take the 45 route from there to Walnut. It would continue to Gaarde and hit Hwy 99W at the Gaarde/McDonald intersection. TriMet proposes that the 67 would turn up Pacific Hwy to Tigard TC, with the 38 covering McDonald. I say that the 67 should cover the whole stretch of Gaarde/McDonald from 121st to Hall, then take Hall to Tigard TC. It only makes sense; why make people transfer if they just want to cross the street? (It would be the whole 48/89 Cornell problem all over again.) The only place where the rest of TriMet's plan conflicts with mine is on 170th, where my Line 49 originally took 170th from Baseline to Farmington. From my perspective, TriMet's plan in this case takes precedent and therefore the 49 will have to find another road down which to travel, such as 160th. Within the year, TriMet will be changing the routing for Line 36 so that it doesn't serve Pilkington, Childs, 65th and McEwan anymore. This is unfortunate for the city of Rivergrove, but since nobody's riding it, and they have had the opportunity, it is only logical to move the bus to stay on Jean Rd. This will allow the bus to serve the Boones Ferry shopping area more efficiently, and it will allow TriMet to extend Line 36 past Tualatin Park & Ride down Durham Rd to King City. (And it would still be a shorter walk to the bus than a lot of communities in Portland have.) This creates a nice east/west connection that will encourage ridership across the whole line. My only suggestion is to lob off the Portland spur at Lake Oswego, but maintain service as 35 buses that become 36 at Lake Oswego. Line 37 is currently the laughingstock of the system, running on average every 89 minutes, with the shortest westbound headway being 72 minutes and the last westbound trip leaving Lake Oswego at 4:28pm! Who wants to ride this line? They cut it back with the service cuts in a way that said, "We want to discontinue this line, but the people won't let us." TriMet plans to run Line 44 between Kerr Pkwy and Tualatin P&R, which allows them to move the 37 to Kruse Way to match the 38 routing. I say eliminate the whole thing. My plan has the 38 doing exactly what TriMet's 37 is doing in Tigard, and they also have the 37 continuing to Progress Ridge via Walnut (I have no idea why the 37 of all lines should ever do this). Put the 37 service into Line 36 and make transfers between the 78 and the 44 easy at Country Club and Boones Ferry. You would end up with better service with that setup than the 37 could ever do on its own. The 96 should run all week. Portland to Tualatin, maybe have it do the Mohawk P&R shortline on weekends. But for Pete's sake, if there ever was demand for service that currently doesn't exist, this is it. Not shown on my map is the new Line 93 (as the current 93 service is enveloped by Line 94). There apparently is going to be a new community in southern Tualatin called Basalt Creek, and TriMet wants to stick a future bus line down to it via Hwy 99W and 124th Ave. This would be convenient for those future people and would also provide both a connection to jobs in the western Tualatin business area and another line of service between King City and Tigard. This is why I propose moving Line 67 all the way to Hall Blvd, because, according to my plan, this would leave three buses on Pacific Hwy leaving central Tigard and three buses on Hall Blvd. Well-balanced. Call it bad marketing strategy to but my most important additions at the end (I arranged this post in a logical order), but there is something significant here in Bull Mountain. There are about 10,000 people living in the unincorporated community of Bull Mountain, and this doesn't account for the Tigard portion along Bull Mountain road. This is a wealthier portion of the city and probably couldn't support a full-week bus to start. But given time and the right types of encouragement, a bus down Bull Mountain Rd would make for a welcome addition to the system. Remember, the more people earn, the more taxes they are paying to TriMet. While partiality toward the more fortunate shouldn't be encouraged when planning transit, we should also never forget them. TriMet does plan some sort of commuter shuttle service for the Bull Mountain area (like the old Cedar Mill Shuttle). However, in such an important part of the Southwest, they deserve a line that covers the whole area. My plan for Line 40 takes it from Tigard TC to Progress Ridge via Hwy 99W, Bull Mountain Rd, Roy Rogers, and Scholls Ferry, which would also serve Tigard's River Terrace community and Beaverton's South Cooper Mountain community, both under construction. 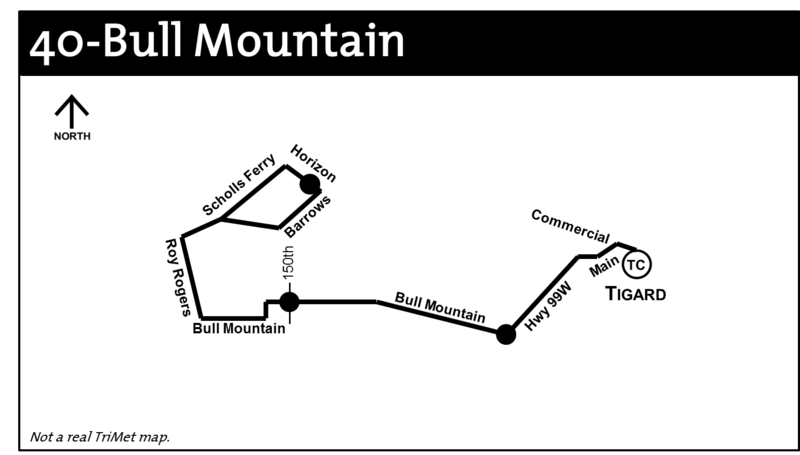 Definitely a second priority to Bull Mountain, Line 41 would cover the rest of the area currently left off the TriMet map. It should start in King City at Pacific Hwy & Durham southbound, run through the town center of King City toward Beef Bend Rd, then travel down Beef Bend to Elsner Rd. 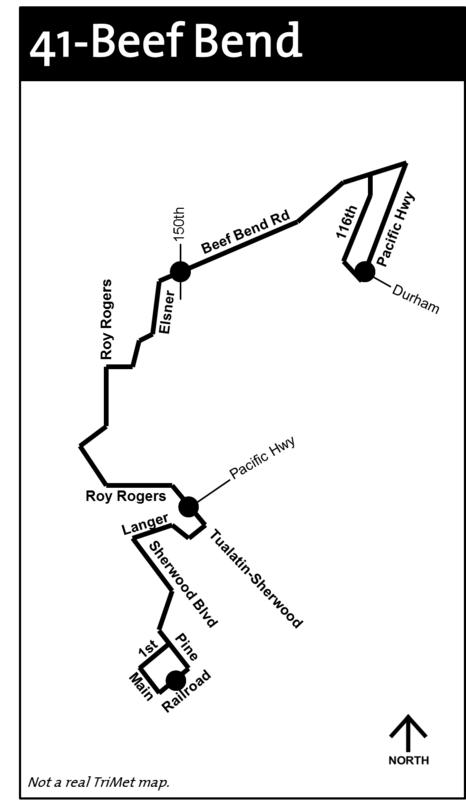 The bus would travel on Elsner to Roy Rogers due to the TriMet district boundary not covering the new portion of Roy Rogers between Elsner (old Beef Bend) and Bull Mountain Rd. Then it would serve the northwest Sherwood community before traveling through Langer Dr and Old Town Sherwood and then returning back to King City via the way it came. This bus could be rush hour only to start and then expanded as ridership allows. If you take a look at my map, you can see that the addition of these two lines (with only 2-4 vehicles to cover both lines) would cover all the area of the Southwest that TriMet currently is missing with real fixed route bus service. The best way to encourage ridership is to offer it. Sometimes, as a transit agency, you have to offer service to an area even if it doesn't result in the highest ridership in the city, solely because it is fare to all the people living and paying taxes within your district boundaries. By introducing this service into the Westside and Southwest areas, you have very quickly covered 98% of the major holes in the district area, and paved the way for communities of the future to thrive and flourish. Cornelius Pass is the 148th Ave of the Westside. It should have a bus line on it, but it doesn't. According to my concept map of proposed TriMet service improvements, it will. Cornelius Pass Rd is one of the main north/south routes in Washington County. Named for the very dangerous pass that traverses the Tualatin Mountains north of Sunset Hwy, the road has evolved over time and continues to grow as the area around it blossoms. Cornelius Pass & Baseline, a major intersection with no bus service. It started out as three different roads: Cornelius Pass from Hwy 30 to Cornell, 216th Ave between Cornell and Baseline, and 219th Ave from Baseline to TV Hwy. In 1996, the intersection with Baseline Rd was redesigned, and the Cornelius Pass name was extended all the way to TV Hwy. There have been quite a few tumultuous construction projects on the road, such as widening the road south of Baseline twice, replacing the bridges at Beaverton Creek and Rock Creek, and now widening the road to seven lanes between Cornell and Sunset Hwy. Now it is a rather busy road, connecting homes, apartments, businesses, retail, and schools. Cornelius Pass and Brookwood Pkwy are the only major north/south roads in Hillsboro that go from Hwy 8 all the way to Hwy 26. TriMet has always maintained that Cornelius Pass isn't a good candidate for transit because of the lack of connection to MAX. That's silly. One could make the same case for Murray Blvd, but they got around that hurdle, didn't they? If you add one north/south bus line at Brookwood (or Brookwood and 229th, as I designed it), you are still left with only one north/south line from SE 10th to SW 185th. So I propose Line 49-Cornelius Pass Rd. 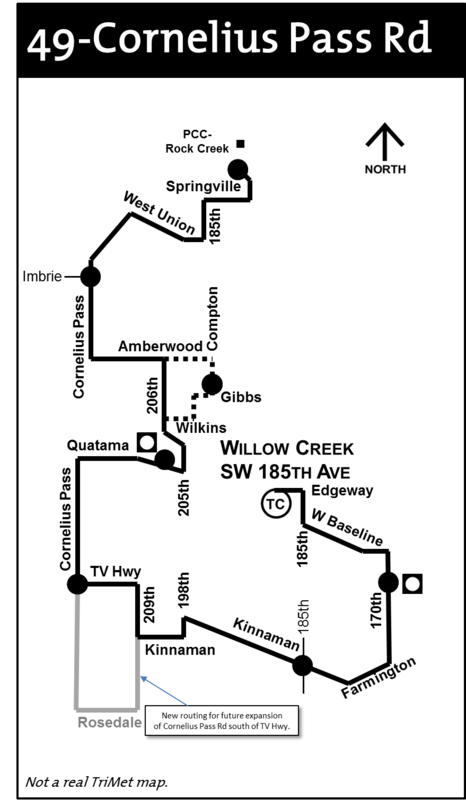 This bus line would start at PCC-Rock Creek and travel down West Union Rd to Cornelius Pass, providing access to the West Union and Rock Creek communities north of Sunset Hwy. (There used to be rush hour service there on the old Line 89, but that went away years ago.) The bus would then cross Sunset and pass the Sunset Fred Meyer shopping area, crossing Evergreen (Line 46) and Cornell (Line 48), serving the east edge of the Orenco district. So how do you get to MAX you ask? Simple logic. Turn the bus on Amberwood Dr just south of Cornell, a direct shot to NW 206th Ave. Taking the bus to 206th would not only provide access to Quatama MAX station and all its surrounding apartments, but also the AmberGlen business district that Hillsboro is so gung-ho on developing (they have even proposed a cable car circulator, which TriMet has never sounded too excited about). After stopping inside the now currently unused bus bays within the Quatama Park & Ride, the 49 would travel west on Quatama Rd back to Cornelius Pass. This would mean that the entire time the bus was not on Cornelius Pass Rd it would be serving something. And by something, I mean the thousands of people who live in the homes, townhouses, and apartments in the AmberGlen and Quatama districts. Now we take the bus down Cornelius Pass straight through to TV Hwy. This is where my great ideas came to a halt. What do I do now? Simple: take TV Hwy one-half mile east to 209th, and turn right, making a quick trip to Kinnaman Rd. This oddly diagonal road is the main east/west route between TV Hwy and Farmington. Along it are Aloha High School, Mountain View Middle School (a block away at Farmington), Kinnaman Elementary School, Farmington Center Shopping Center, and the Edwards Center, a home for people with developmental disabilities. Maybe the road isn't as high profile as Cornelius Pass, but it's as important as any road in Aloha. This road would produce many more riders in the South Aloha area. During late hours, Sundays, or the like, the route could turn around at TV Hwy and Cornelius Pass via Johnson and 214th Ave. This section of the route is historically important, and is in fact the reason this new line is numbered 49. You see, when Westside MAX opened in 1998, TriMet began service on a route called 49s-Willow Creek (when they used 's' for shuttles and 'X' for express lines). 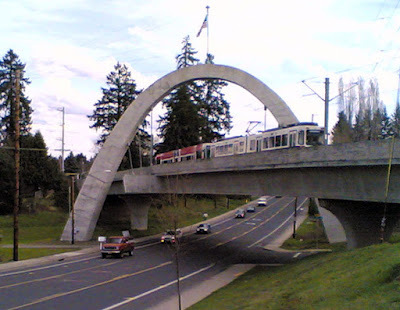 Within two years, they re-routed the line to Quatama MAX station instead of Willow Creek (see TriMet's old page for it here), and it became the 49s-Quatama. This bus served the AmberGlen corporate park that was in development, but the corporate part kind of peaked well before it was completed and ridership never lived up to expectations. So in 2003 they eliminated the line. Though the business complex growth leveled out, and almost died out during the recession, the City of Hillsboro had other plans. They saw AmberGlen as a major community development opportunity (see this for details). Their dream looked like the intermingling of business, multi-format residential, and even an OHSU facility. They have started building some homes in the area now, but nothing as substantial so far as their grand vision. However, considering the improved economy and the overall growth of Hillsboro over the last ten years, AmberGlen is as good as any for a spike in growth to take place. And this Line 49 can work right in the heart of it. The bus would travel down 206th Ave all week, but notice the dotted lines on the map for my new line above. This represents a rush hour side-routing that could be taken every other trip or so, or even a quick loop that could turn right back to the MAX station a few times. It covers all the area that was served before while continuing to place an emphasis on the residential areas nearby. Notice that I didn't say anything above about where the line ends on the south end. That is because I really don't know. The line would take Kinnaman to Farmington, and then there are a few options. You see, I designed the line before TriMet released their concept map of the Southwest area, which included the extension of Line 67 from Merlo Rd to Tigard TC via 170th, Hart, 155th, Brockman, 125th, and Walnut (or in my plan, Gaarde). My plan took Line 49 to Willow Creek via 170th and Baseline, as shown in the map above. Obviously, if the 67 were extended, this would be a lot of redundant service on 170th, a road with a lot of life to it but not necessarily enough for two bus lines for that length of the road. 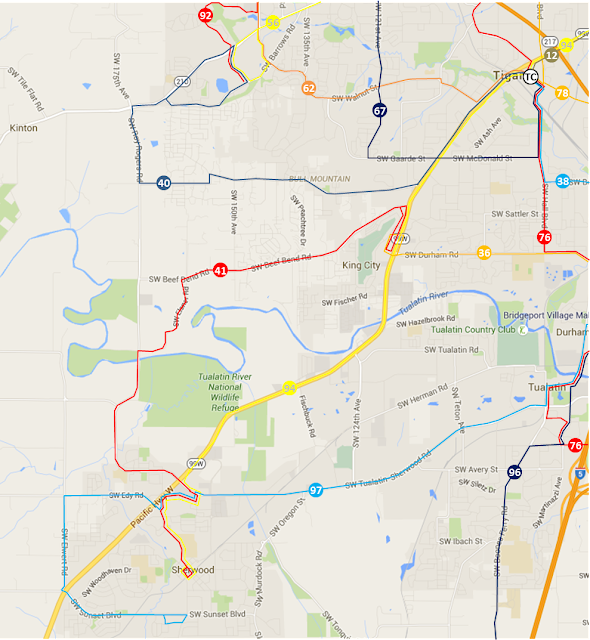 I love my old 170th plan for the 49, but that its terminus would probably have to be reworked. The best idea so far that I have is to take the 49 down Farmington to 160th, which would become Millikan and have it end at the Millikan Way Park & Ride. This in itself is a very decent plan, but more study would have to be done to determine if it would be cost-effective and would generate enough ridership. Have you ever noticed that large field south of TV Hwy near Harvey the giant bunny? That has always been outside of the Urban Growth Boundary (UGB) and no one could develop it. However, Hillsboro has annexed it and is now ready to start work on the new South Hillsboro community they have planned there. Basically, they will extend Cornelius Pass Rd to Rosedale Rd, and many of the other through-roads on the west and east will converge at Cornelius Pass. Over 8,000 new residences are planned for this area. (See Hillsboro's page about it here). My plan is to take the 49 from Cornelius Pass to Kinnaman via TV Hwy and 209th, but it is designed to take this new area into consideration. The bus could be re-routed down the new Cornelius Pass extension all the way to Rosedale and back up 209th, which would create good transit access for all those houses off 209th also. Or, as one of their concept maps shows, take Cornelius Pass to Kinnaman, and turn left (seems too simple...). Either way, this flexibility would do a large part to make the 49 a successful and thriving bus line for years to come. Turns out that Hillsboro is going to break ground on the Cornelius Pass extension this summer, so these plans for the area all may change before the bus even goes into service! Think I may be being a little too passionate about one road? No. I've spent my whole life watching this road grow. It's time to give it the bus line that it deserves. Do you have any questions or comments? Email me at comments@transitriderpdx.com with any input you may have. Also, if you like anything you see here and want TriMet to hear about it, you can email them and reference my ideas (or submit ideas of your own) at future@trimet.org. In advance of this Thursday's open house where TriMet will be meeting with riders about their plans to expand bus service, I am unveiling my Top 10 suggested service improvements. All of these were explained in my last post, but I will go into some greater detail concerning routings, and rationale. Please note: these are changes I believe must be made for the TriMet system to reach its potential. So read carefully; you might find this information extremely helpful. 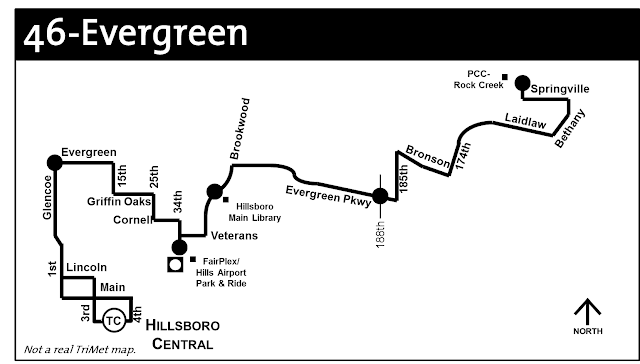 Hillsboro is one of the most forgotten cities in the Portland area as far as transit. Its original design was based around the question, "How can we get everybody out there from Downtown Portland in one shot?" It was decent for commuters but not the local Hillsboroan. Then came Westside MAX, which paved the way for expanded service. However, these plans became dated quickly as the city grew and the designs weren't following the flow of people anymore. So after 18 years, it's time to start afresh. Hillsboro is the fifth most populous city in Oregon, with right around 100,000 people. It is ethnically, culturally, and economically diverse, with thriving communities and growing businesses. Everybody knows how important Intel is to the city (employing 60% of the sum of the employees of the top ten employers); but Hillsboro has many more businesses, from very small to very large, and its economy has continued to do rather well even during the Great Recession. But did you know that between TV Hwy and Baseline Rd/Main Street, there is no north/south bus route for 4 1/2 miles? This is something long overdue for change. TriMet has made two major enhancements over the last ten years to lay the groundwork for the future: (1) establishing Line 57-TV Hwy as a Frequent Service line and one of the busiest lines in the system, and (2) re-routing Line 48-Cornell to stay on Cornell from 10th & Main all the way to Cedar Hills Blvd. These routes give you as a designer something to build around. Currently, there are only three other bus lines that travel into Hillsboro: Line 46 through North Hillsboro on weekdays only, Line 47 on Baseline, 229th, Evergreen and up to Bethany also on weekdays only, and Line 52 on 185th Ave through Tanasbourne. (See TriMet's system map for context). On Sundays, for example, along with the 52, only the 48 (hourly) and 57 (15 minutes) are running through the city. The only major city in Portland with worse weekend service is Tualatin. So what do we do about it? Below are my suggestions for taking this sorry group of four lines and tweaking them just a little to result in six lines, no lost significant service segments, and all the system coverage any Hillsboroan ever wanted (within reason, of course). No changes to these lines should at all come as a shock, as they are already progressing fast along their evolution toward the ultimate goal. Line 57 currently runs every 15 minutes on weekdays (6am-9pm), Saturdays (9am-6pm) and Sundays (10am-6pm), with 20 minute service for most of the surrounding times. Span of service is not an issue. The only improvements that could be made are adding a few more early morning/late night trips, expanding 15-minute weekend service by a few hours, and maybe throwing in a couple of rush hour trippers out of Beaverton TC. All this could be done at one service change at little cost to the agency. Line 48 should eventually be Frequent Service as well, as it provides the other half of the backbone of Hillsboro, as well as the rest of the communities in the west and northwest metro area. The bold lines on this map indicate that these lines, as well as the 52, are Frequent Service. Yes, I split Baseline and Evergreen. I know the names go together like salt and pepper, Kelso and Longview, and Kirk and Spock, but these are two roads that really should never have been on the same line. If TriMet wants the "grid" that they envision that looks like East Portland, then there should be four east/west routes: TV Hwy, Baseline, Cornell, and Evergreen. After much deliberation (actually way more than any sane human should use), I concluded that the Baseline bus should be the 47 (and the Evergreen bus the 46) for two reasons: (1) everyone is familiar with saying "47-Baseline..." every time they say the route name, and (2) this way the lines would leave Hillsboro TC the same way as they do now, avoiding confusion. My routing of Line 47 is simple. It would leave Hillsboro TC via Oak/Baseline, 10th, and E Main as it does now, continuing on Baseline all the way to 185th. There it would turn in to Willow Creek TC. Would it continue? Maybe. In my current design, I have another line serving Baseline from 185th to 170th. There's really no pressing need for a line down Jenkins from Murray to 170th (only thing there is Costco and Nike, both served by the 67, and in the latter's case, two other lines). So, in my opinion there isn't a need for a bus to run all the way from SE 10th to Cedar Hills Blvd. I should know---I work on Baseline Rd! Line 47 would run all week, with 15 minute service during peak hours and 20-30 minute service at other times. With this line splitting the 48 and 57, we now have a logical and efficient east to west system through the heart of Hillsboro. I also spent a lot of time trying to figure out exactly what I needed to do to get this line to work. What I wanted was a line that ran straight down Evergreen. But I also didn't want to leave out the Griffin Oaks and Brookwood/Main Library sections of the current 46, which serve a significant amount of businesses. Then I had an epiphany: there is almost nothing between 15th and Brookwood due to the presence of the Airport! So, I routed the new 46 to serve all of the current 46 area. 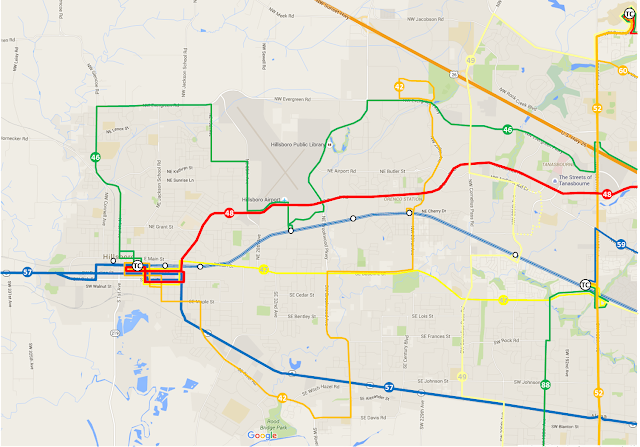 I decided that it should travel out of the FairPlex MAX station via Veterans Dr, as it wouldn't skip any stops, it would allow for stops on Brookwood at Veterans (for the area between Main & Cornell) and at Cornell (where there currently are no 46 stops due to inaccessibility, and it would allow for access to anything the City of Hillsboro decides to put on Veterans Dr. Also, it wouldn't serve Dawson Creek Dr or Shute Rd, which is unfortunate. I just couldn't come up with a logical way for the route to pass through and cover those businesses at the same time. Fortunately, Brookwood provides access for most of those businesses at a reasonably short distance. TriMet's concept map shows no fixed route service through the Glencoe area. Rarely would I say something like this, but frankly that is absolutely stupid and ridiculous. Look at the above map, particularly the darker area of the background that indicates the city and metro area boundary. Now remove the green line in your mind. Notice how much area is now lacking transit coverage? That would be about 20% of the city, or, taking the average population, about 20,000 people, more than nine legitimate cities in the Portland area! The Glencoe area may have lower ridership, but that's what you get when your bus comes only every 60 minutes at its best. In this case, better service would equal more ridership. The big question on everyone's mind will be this: What about all the Intel employees who ride from Bethany to work everyday? Didn't TriMet just make the service change to send the 47 to PCC-Rock Creek for those employees? Yes, they sure did. And so far, we don't have full buses. But never fear! My plan actually works better for you. You see, instead of the Evergreen bus stopping on 229th in front of the Ronler Acres campus, it will stay on Evergreen, where there is another entrance on the north side of the campus. Also, due to it enveloping the current Line 46, it will also serve the Jones Farm campus! So there's two Intel campuses for the price of one (literally). Fifteen minute rush hour service for some parts, half-hour service the rest of the week. I think that with these modifications to the Evergreen line, it will bring a real boost to ridership in all these areas. So I bet you were wondering what I did with 229th Ave. Trust me, it didn't get forgotten. Actually, that was where I spent most of my brain matter in redesigning Hillsboro. I wanted a main north/south line, but I didn't want to leave Brookwood out. Once I realized that I could have the 46 serve Brookwood by the Main Library, all the pieces started coming together. Actually, the same logic that I used for Evergreen was applied to this line. You see, there literally is nothing on Brookwood between Cornell and E Main. One street starts just north of Main, but that's in walking distance from Main. Look at Google Maps. See? There's not even a house on Brookwood right here. So, therefore, no reason for a bus line. So then it hit me: Why don't I send the bus from Brookwood in the south to 231st in the north? Perfect. So where would it end in the north? All it would need to do is hit Evergreen and meet with the 46. I then realized that I could turn the bus around via Bennett and 235th; it would serve both the north entrance of Intel and the Hillsboro Stadium, something that has never had direct access via transit. And the line would be short enough, it wouldn't need a layover spot. That's all it needs to do in the north. What about the south? I started looking at maps and realized that there is a whole new area of civilization south of TV Hwy that has no transit access. I even found the mysteriously missing Witch Hazel Elementary School. Take the bus down to Davis, turn right and you hit River Rd. 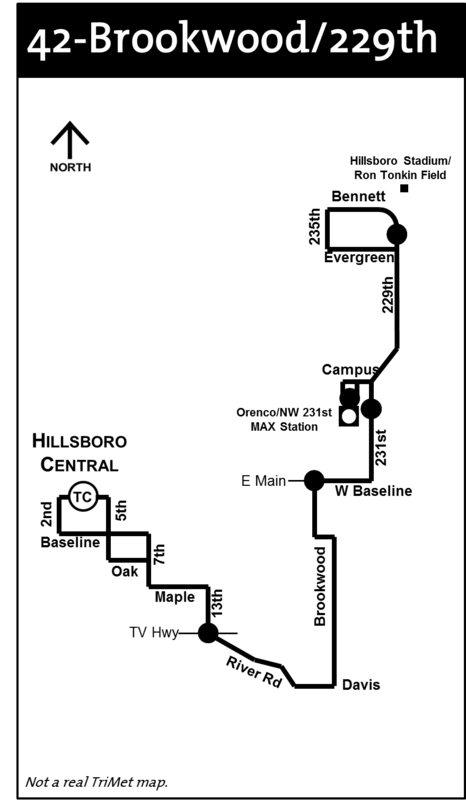 This would mean all of South Hillsboro, Witch Hazel, and the area around HilHi would have transit! Then I took a daring step further: I had it cross TV Hwy. River Rd becomes 13th, which hits Maple, where the bus can go back across Hwy 8 to Seventh Ave. Then it would get back to Oak and Baseline to get to the transit center. Yes, those turns are a little tight, and you could very easily have it just go straight in from River Rd via Hwy 8. However, I think with this extra coverage it can help increase access to those parts of inner Hillsboro that represent some of the least rich portions of the population. This bus would only have to run every 30 minutes to an hour on weekdays and Saturdays, but you would have the flexibility to put a lot more service in areas where it's needed during peak times: 229th between Orenco Station and the Hillsboro Stadium. This is the most controversial portion of my concept plan. It also has some of the most logic and benefits. There has been a lot of thoughts and planning on my part to design Line 49. Even a lot of driving as I wanted to make sure I got it right. I live within a half mile from Cornelius Pass, so if anybody should know anything about it, it would be me. I've lived in the same place all my life and have watched the city grow around Cornelius Pass to make it one of the most important thoroughfares in the whole Metro area. And TriMet still doesn't want to put a bus line down it. Stay tuned for Part 2 of this ten part series, as I break down in even greater detail all the cool things that make my Line 49 one of the greatest potential additions to a system that is evolving into one of the greatest transit designs in the country. Questions, comments, suggestions? Email me at mail@transitriderpdx.com or tweet me @TransitRiderPDX. Please do not steal what I say without attributing it to me! Thanks.. Picture Window theme. Powered by Blogger.